People living in one of Mozambique’s largest cities have been warned to expect the “worst-case scenario” as a major cyclone makes landfall. Cyclone Idai, which is carrying winds of up to 225 km/h (140 mph), is making landfall near the port of Beira. A storm surge of at least six metres (20 feet) is expected near low-lying Beira, a city of 500,000 people, Météo France said. 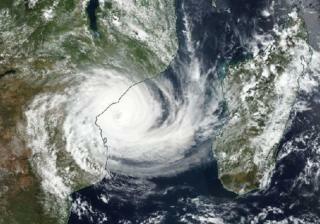 Heavy rains have already killed about 100 people in Mozambique and Malawi. Beira is the fourth largest city in Mozambique and its major port sits on the mouth of the Pungwe river, that runs to Zimbabwe. Météo France, which monitors French territories in the Indian Ocean, said Idai was “an extremely dangerous tropical cyclone” packing a “life-threatening” storm surge of at least four metres along the coast, and six metres near the mouth of the Pungwe river near Beira. The surge could be even higher because of high tide, Météo France warned. The cyclone’s late change of course meant that “the worst case scenario is very likely“, it added. Images posted on social media showed significant damage to Beira as the storm approached, with large trees uprooted. Beira has often seen the brunt of the storms and has worked to limit the effects of rising waters brought about by climate change through a series of infrastructure projects. The Global Facility for Disaster Reduction and Recovery, a group linked to the World Bank and the UN, says Mozambique is the third most at-risk country in Africa when it comes to extreme weather.